Designed by a Doctor of Optometry these Glasses and Band Case are an Eyewear Convenience. 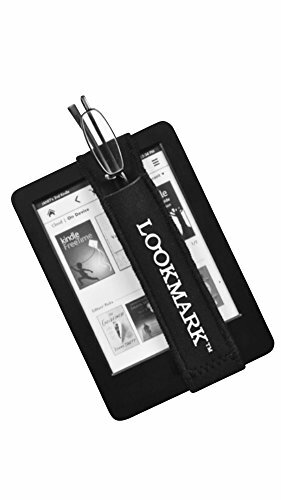 Your glasses and E-Book or tablet are always in the same place. Enlarging your font does make it readable but the visual clarity is still blurred. The lenses are of the highest quality with Anti-scratch and Multiple Anti-reflection Coatings. The frames are made to ophthalmic standards with spring hinges and eyewire screws. The eyewire allows custom prescriptions to be installed if required. The Neoprene Band may be stretched over other reading materials such as books, magazines or newspapers. If you are unsure of the prescription you require your age can give you a guideline. 40-50 years +1.00 50-60 years +1.50 60-70 years +2.00 70-80 years +2.50 If you have an underlying prescription see your eye care professional. If your problem is NOT having but FINDING your reading glasses! Prescription Quality Safety Lenses With Anti-scratch and Anti-reflective Coatings, Sturdy Frame with Spring Hinges and Eyewire Screws. Includes Glasses, Band Case and Gift Box. If you have any questions about this product by LOOKMARK, contact us by completing and submitting the form below. If you are looking for a specif part number, please include it with your message.